Cannot recommend enough! During my short stay at Cinnamon Sally's everyone made me feel like it's almost my second home. My best go at describing the experience would be "a remotely situated large apartment that you share with your besties". It's clean, the music selection was awesome, I could refill my reusable water bottle (!!!) and the staff was very accommodating and friendly - what more could you ask for! 10/10 would stay here again. Had such a good time here that I genuinely experienced mild depression in the 24 hours after leaving. Perfect central location in beautiful Riga, friendly relaxed homely atmosphere and lovely staff. Already planned my next trip. Great location, beer on draft, friendly and communal atmosphere. 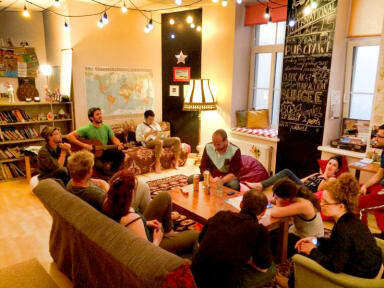 Absolutely the best location for a hostel - near the central bus and train stations, not far from the historical center. The atmosphere is just magical, very cosy and friendly. Great place with excellent vibe!! Really one of the best hostels I have stayed, surprisingly in my own country :) couldn't wish for a better location, on the edge of the old town, train and bus stations just across the street. Shopping mall right in front of it. Staff was very friendly and great facilities, books, board games, TV, activities, clean kitchen and showers - had it all. Definitely recommend and will come back one day. Paldies! Super central, clean and cozy. Rooms are well heated. Staff is extremely friendly and helpful. Recommended! Cinnamon Sally is the most gorgeous little hostel in the perfect location for reaching the old town and all public transport! The beds were comfortable, rooms and bathrooms were immaculate and staff was kind, friendly and helpful with lots of great recommendations. There’s a lovely living room that always had someone to talk to and music or a film playing, even though it was the very quiet season. Can’t recommend this place enough! The location in the city is good. But it’s a bit weird that it’s some office building with lots of hostels. However when you are inside, it’s cosy and home-y. Everything is clean but the hostel was almost empty, so... The bed was alright though the blanket was so small. It was really warm inside (while really cold outside). All in all, I am satisfied with my choice.